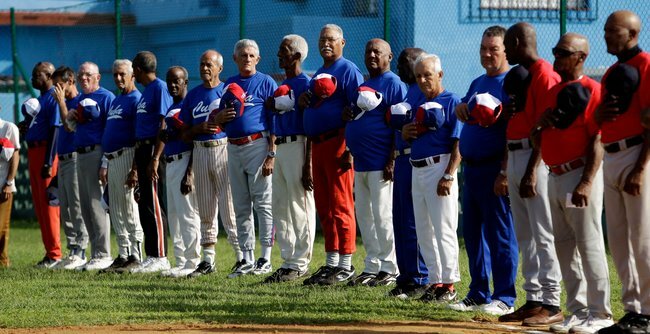 this story has been circulating for several days on how some fogie senior softball team from Eastern Massachusetts was in Cuba to play against the Cuban old timers. The EMASS team has been traveling to Cuba for the last several years to play in this "feel good" softball games. Well...."feel Good" games...not exactly....Michael Eizenburg, the organizer of this softball tournament, is "president of Educational Travel Alliance, a company based in Wellesley, Mass., which he started in 1998 largely to make arrangements for Americans — scholars, performers, foundation workers and the like — to travel to Cuba"
Somehow by playing softball this will magically solve the issues between the U.S. and Cuba (Just like the Juanes concert did?). Look I have no problems with these guys going to Cuba to play softball and I was going to ignore this story, but something inside of me did not feel right. From past history most of these “cultural exchanges” usually turn out to be a propaganda victory for the dictatorship. I have an idea for Mr. Michael Eizenberg, why don’t you go to south Florida and play some Cuban exile ole timers in softball(better bring you’re A game) and listen to their experiences! Monday, November 21 - Police agents detained activists, Joel Lazaro Carbonell and Emilio Jerez for defending the business of a female street vendor in Havana who was being openly blackmailed by a policeman. Jerez was released but the situation of Lazaro Carbonell is unknown. The ex-political prisoner and independent journalist Enyor Diaz Allen was released 48 hours after being arrested for photographing a mob attack against the home of human rights defender, Osvallemi Grant Guerra. Another independent journalist, Julio Beltran Iglesias, a member of the independent group, Cuban Republican Party, was also released and abandoned in Wajay, 30 kms. away from his home. Beltran Iglesias was kidnapped near his home on November 19 by Cuban State Security in Havana and subjected to cross examination and was accused of being a troublemaker as well as a mercenary of the “Imperialists” (USA), among several other charges. The following five activists of the 30th of November Frank Pais Movement were arrested as they were on their way to promote “Resistance Day” at the home of the Secretary General of the National Front of Civil Resistance and Disobedience, Jorge Luis Garcia Perez Antunez in Santa Clara (Central Cuba): Yoan David Gonzalez Milanes (handicapped, missing a leg), Mauri Emilio Dupuy Arredondo, Guillermo Rodriguez Rodriguez, Verlay Vejerano Estrada and Juan Luis Perez Garcia. They were all abandoned in remote farm areas. In Santa Clara (Central Cuba), a total of 17 human rights activists were violently detained when they tried to prevent the Cuban regime’s forced eviction of Yulema Benitez Sigler and her three children from their humble home. Initially detained were: Damaris Moya Portieles, Enrique Martinez Marin, Idania Yanez, Yasmin Riveron, Yusmany Rafael Alvarez, and Jose Luis Lopez. Other human rights defenders who went to the police station to demand the release of their fellow activists and were also arrested: Guillermo del Sol Pérez, Alcides Rivera Rodríguez, Víctor Castillo Ortega, Ana Rosa Alfonso, Jose Luis Lopez, María del Carmen López, Ramón Abreu, Mayra García, Rolando Ferrer Espinosa and Omar Núñez Espinosa. Wednesday, November 23 – Jose Batista Falcon and Raudel Avila Lozada of the umbrella human rights group, Cuban Patriotic Union were intimidated and threatened with being arrested by the police as they were disseminating copies of the Universal Declaration of Human Rights to the residents in the Eastern city of Palma Soriano. Donaida Perez Paseiro and Yris Perez Aguilera of the Rosa Parks Feminist Movement for Civil Rights were arrested by the political police as they were leaving the house of Yris in Placetas (Central Cuba) so that Yris could seek the treatment of a specialist for the head injuries caused by State Security agents during a beating in May 2011. Both women were subjected to inhumane treatment and conditions during their arrest and released 24 hours later. Yris is the wife of Antunez and their house is permanently surrounded by State Security Agents who threaten, beat and follow them wherever they go. Thursday, November 24 – Ex-Cuban prisoner of conscience, Librado Linares, of the Cuban Reflection Movement denounced of the police operation and the mob attack to the home of human rights defender and member of the Cuban Reflection Movement, Niursi Acosta Pacheco in the town of Vueltas, Villa Clara (Central Cuba). Activists had gathered to march on to the town’s Central Park and hold and a public act but the aggressors intimidated and threatened the activists by surrounding the house and carrying knives, machetes and metal tubes. Victims of this act of repudiation were: Orlando Triana Gonzalez, Antonio Suarez Fonticiella, Miguel Sotolongo Sotolongo, Raul Gonzalez Manso, Leonardo Rodriguez Alonso, Niursi Acosta Pacheco, Jose Marino Andrades Crespo, Damaris Hidalgo Garcia, Ramon Mesa Rodriguez, Alexander Mesa Rodriguez, Juan Manuel Sarduy Segrel, Diego Sabala Abreu, Manuel U. Acosta and Librado Linares. In Havana, the following activists marched down an important avenue in El Vedado with a white sign honoring the recently deceased leader of the Ladies in White, Laura Pollan and on behalf of freedom and human rights in Cuba: Sara Marta Fonseca, Odalys Caridad Sanabria, René Ramón González, Ismael Alfaro and Ramsés Camejo. They were all detained and released a few hours later after being threatened and intimidated by Cuban State Security. In Pinar del Rio a march was also successfully carried out in spite of the numerous arrests. Conrado Rodríguez Suárez, member of the Democratic Alliance of Pinar del Rio (ADP) continues under arrest. In Sagua La Grande, paramilitary groups surrounded and attacked the home of the human rights activist Jesus Reinaldo, located at Carolina Cabrera Street #60 to prevent the meeting of members of the peaceful resistance. Pedro Campa Almenares was released after being held in the Prison of Aguadores since August 2011. In Havana, the police arrested more than a dozen dissidents who were on their way to participate in a forum on racial discrimination to be held November 24-26 at the home of Antonio Madrazo located at Calle 23 #710 entre C y D apto 2 piso 1, Vedado. Among those detained were dissidents Manuel Cuesta Morua, Darsi Ferrer and Yusnaimi Jorge Soca, Guillermo Lizama, Leonardo Calvo, as well as Danilo Maldonado. Friday, November 25 - José Peña Batista, president of the Calixto García Movement, was arrested and remains in custody. The previous day a march had originated at his home and gone on to a Park in the town of Velazco, in the province of Hoguin ( Eastern Cuba). Sunday, November 27 – In spite of the intimidations and threats of beatings and arrests, 38 Ladies in White were able to hear mass and march in the city of El Cobre in Eastern Cuba while in Havana 46 members of the Ladies in White “Laura Pollan” walked down 5th Avenue after attending mass at the Church of Santa Rita. International recognition of the peaceful resistance movement in Cuba and solidarity for these activists is crucial. 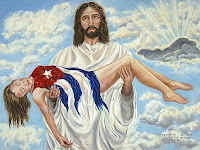 The Coalition of Cuban-American Women makes an urgent call on religious, civic, political, and cultural entities and its leaders, as well as to non-gonvernmental human rights organizations worldwide. "Cyber Commandos spill phone numbers of Top Cuban Officials"
Want to know the home address of Cuban ruler Raúl Castro’s daughter? How about the home phone number for his No. 2, José Ramon Machado Ventura? Or the cell number for Minister of Communications Ramiro Valdés? A Miami-based website is publishing those and myriad other details on the private lives of top Cuban officials, saying it wants to warn “the darlings of the dictatorship” that they will face a dark future if the government collapses. Also obtained from inside Cuba are digital lists of the cell phone numbers for tens of thousands of security and intelligence officers, and the street addresses of virtually every single military base on the island, contributors to the site say. The leak of such personal details, out of a communist-ruled country where secrecy has long been paramount, reflects the Castro government’s growing inability to control the flow of information in the age of the Internet. “Technology is going to destroy them,” said one post on the website CubaalDescubierto — Cuba Uncovered — where the details are being posted by FUEGO, or “fire,” a group that claims to be made up of Cubans in Cuba and on the outside. The site already has published what it says are the home addresses, phone numbers and other personal information of more than 20 top Cubans since it started posting those kinds of details about six weeks ago. They include Machado Ventura, Castro’s No. 2 in the ruling Council of State and the Communist Party; former Defense Minister Julio Casas, who died Sept. 3; and Valdés, a former Interior Minister, widely viewed as one of Cuba’s most powerful officials. It also published the address and home phone of Castro’s daughter Deborah and her husband, Luis Alberto Rodriguez López Callejas, an army colonel who runs military-owned businesses that account for an estimated 60 percent of the island’s economy. The addresses and phone numbers for Angela and Agustina Castro Ruz, sisters to Raúl and Fidel Castro, and for Sonia and Jose Alejandro Espin, sister and brother of Raúl Castro’s late wife, Vilma Espin, also appeared on the page. El Nuevo Herald could not confirm all of the details published, but its calls to eight of the phone numbers confirmed that five were correct. One was confirmed by a female relative and two by housemaids. Three others did not answer, including Valdes’ purported cell. Percy Alvarado, identified by the Cuban government in the late 1990s as one of its intelligence operatives, told El Nuevo Herald that he received a threatening call on his cellular phone earlier this month from people who identified themselves as members of FUEGO. We live in the best country in the world, despite all the negativity, complaining, and the "objectivity" of the media.The U.S. is the beacon of hope, opportunity, and freedom. Thank you Lord for my family, friends, and for your blessings! God bless everyone and God bless the U.S.A.!!! Cancion a Laura Pollan,version de estudio. El Nº 11 de la Revista Voces, fue lanzado en la sede de la Academia Bloguer de Cuba y dedicado a la mentora y fundadora del Movimiento Damas de Blanco Laura Pollán, en la noche del 11 de Noviembre y con la presencia de algunas de sus miembros y de su hija Laura María Labrada Pollán. Orlando Luis Pardo, autor del blog Lunes de Post Revolución dirigió el lanzamiento de la revista en cuya portada la letra L en alusión a Laura Pollán formaban el número 11 con dos gladiolos, en el lanzamiento estuvo presente Laura María Labrada Pollán junto a Berta Soler, Aimé Cabrales Aguilar, Katia Sonia Martín Véliz y Odalys Sanabria. Videos de la canción Laura Pollán compuesta e interpretada por Amaury Gutiérrez en el programa “A Mano Limpia” de Oscar Asa conmovió a todos los presentes al ser exhibido fue sinceramente agradecido por su hija Laurita. Washington, D.C., November 10, 2011 - The Inter-American Commission on Human Rights (IACHR) expresses its concern over recent attacks suffered by Idania Yanes Contreras in Cuba. She is a beneficiary of precautionary measures granted by the IACHR on June 8, 2011. Information the IACHR has received indicates that Idania Yanes Contreras was arrested on October 31, 2011, when she was protesting to defend the rights of a political dissident who was on a prolonged hunger strike. Idania Yanes Contreras reportedly was taken to a police unit, dragged by her hair, and severely beaten in the head, abdomen, and back before being released on November 3, 2011. According to the information the IACHR has received, she left the detention center in a fragile state of health and entered the Arnaldo Milián Castro Hospital with injuries to her body. The Inter-American Commission considers extremely serious the fact that the State of Cuba has not adopted the necessary measures that were requested by the IACHR to protect the life and physical integrity of Idania Yanes Contreras, considering the threats, attacks, and harassment to which she has been subject. The IACHR calls to mind that the State has an obligation to investigate of its own accord the facts that have been reported, and to punish those responsible for the attacks. The IACHR urges the State of Cuba to immediately and effectively implement each of the precautionary measures granted by the Commission. Check out Michael" I love Cuba's healthcare system" Moore's SUMMER home in the above picture. He wants you to believe that he is NOT in the 1% of Americans as he says who have all the wealth, yet.......he has this summer home, that most of us can ever dream about and he is worth 50 million! He wants to project an image that he is JUST like the Occupy America protestors. Michael probably showed up to the protest in a limo. Just like Fidel tried to project that he was an ordinary Cuban and was for the poor.....NEWSFLASH...Fidel and Raul's father was one of the wealthiest guys on the island folks, Fidel went to the elite of the elite schools. He still lives in a lap of luxury, yet he denies this to ordinary Cubans. Remember the poster child for the left, leche Guevera? Yep, another elitist rich, spoiled, elitist brat promoting the absurd ideology of marxism and encouraging hatred amongst one another. Alcides Rivera Rodriguez and Rolando Ferrer Espinosa, two activists on a hunger strike since September 28, 2011, protesting the Cuban regime’s violence against peaceful activists in the island; both admitted respectively, on October 27 and 28, 2011, to the Provincial Hospital Arnaldo Milian in the central city of Santa Clara, were forced out of the medical center by special police forces that had militarized the building. Ferrer Espinosa, was hoisted away on Monday, October 31st to his home in spite of the fact that he was on supplemental oxygen, was shaking due to a high fever, is weak after losing more than 30 lbs. of body weight, and has severe respiratory ailments as well as metabolic acidosis. On November 2,, Alcides Rivera, who was diagnosed with bronchopneumonia and has lost almost 60 lbs, was also forcibly taken out of the hospital. Both Alcides and Rolando declared that they will continue their hunger strike. On the afternoon of October 31,when Rolando Ferrer was taken out of the hospital by State Security agents, a group of human rights defenders who had gone to the hospital in solidarity with both hunger strikers, were violently arrested: Idania Yanes Contreras, Damaris Moya Portieles, Olga Lilia González Barroso, Alexey Sotolongo Díaz, Enrique Martínez Marín, Orlando Alfonso Martínez, Jorge Ramírez Calderón, René Fernández Quiroga, José Lino Ascencio López, Jorge Alberto Liriano Linares, Yasmín Conledo Riverón, Yusmani Rafael Álvarez Esmori, Yanisbel Valido Pérez, and Víctor Castillo Ortega. The activist, Julio Columbie, who was taking care of Ferrer Espinosa’s in the hospital room was beaten and taken away in a brutal manner. Alcides Rivera Vázquez, son of Alcides Rivera and Zuleika Cepero Méndez, wife of Rolando Ferrer were also taken into custody. Jorge Luis García Pérez “Antúnez” and his wife, Iris Tamara Pérez Aguilera, of the National Civic Resistance Front were beaten and dragged out of the intensive care unit where they were accompanying Alcides Rivera, as other patients screamed at the agents to stop the mistreatment. After all pro-democracy activists were taken to the Unidad Provincial de Operaciones (UPO), they were dispersed to different municipalities in the province of Villa Clara and released by November 3rd. Alberto Reyes Morán, Michele Oliva López and Ramón Arboláez Abreu were subjected to short term detention when they appeared at (UPO) to inquire about the wellbeing of their fellow human rights activists. Also, as they were on their way to the Arnaldo Milian Hospital, Jorge Vázquez Chaviano, Nosbel Jomarca Deubides, Maidelis González Almeida and Yosmel Martínez Corcho were taken down from a bus in the outskirts of the city of Sagua la Grande and remained detained for a few hours. On November 1, 2011, when activist Guillermo Fariñas tried to see Alcides Rivera at the hospital, he was brutally arrested and released on Thursday, November 3. The particular case of the human rights defender and member of the Central Opposition Coalition, Idania Llanes Contreras, wife of Alcides Rivera, is alarming. On Wednesday, following the brutal beating on October 31, and still under custody,Idania developed a high fever and painful joints, began to shiver, to vomit and had a profuse vaginal bleeding. A physician at the detention center who saw her told her she might have dengue, that ” there was a lot of dengue going around.” Once released she required medical assistance at a hospital and following laboratory tests, a doctor told Idania she had an “unkown virus”. 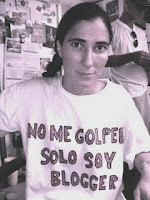 Idania was arrested and held in the same prison cell with the activists Yanisbel Valido and Damaris Portieles. In Havana, this Sunday, November 7, 2011, though forty Ladies in White atended mass in the Church of Santa Rita and were able to march through Fifth Avenue with the image of Laura Pollan, at least six women were threatened by the political police to prevent their participation in the mass and the peaceful march. Among them were: Magaly Norvis Otero, Sandra Guerra, Elizabeth Kawooya and Dignora Figueredo. Also this Sunday in Santiago de Cuba, a priest, several nuns and parishoners interceded on behalf of seven Ladies in White so that the police would not subject them to acts of repudiation and attacks. The women who were taken away by a car provided by nuns at the Cathedral of Santiago de Cuba were: Belkis Cantillo Ramírez, Aimee Garcés Leiva, Mari Blanca Ávila Expósito, Oria Casanova Moreno, Adriana Núñez Pascual, Tania Bandera González, and Tania Montoya. The Coalition of Cuban-American women makes an urgent call to the free world, to the press, to men and women in positions of leadership, demanding a stop to the systematic cruel and inhumane acts committed by the Cuban regime against members of Cuban civil society who defend fundamental freedoms in their own country. The lives of these human rights defenders, particularly of women activists, are in pressing danger. "Cuba legalizes sale, purchase of private property"
On Thursday Cuba's communist newspaper, Granma, announced that real estate will be allowed to be bought and sold. REALLY, by whom? Fidel and Raul right? Sorry not buying this red riding hood story. Now if all property has been at the hands of government for decades, and most of those properties were stolen and confisgated by the castro dictatorship, I don't understand how this will work and Cuban exiles WILL NOT be allowed to buy properties of course. Three Cuban dissidents jailed in a 2003 crackdown and imprisoned until their exile last year to Spain, brought their story to Capitol Hill Thursday. The three were sponsored by European Union politicians who hope to build a trans-Atlantic coalition to put as much international pressure on Cuba as possible. "They've been in the belly of the beast, they know what it's like to live there," said Rep. Ileana Ros-Lehtinen, R-Miami, said of the three: independent journalist Normando Hernández González, Regis Iglesias Ramírez of the Varela Project and former Nueva Prensa Cubana Director José Luís García Paneque. "And they know what a difficult struggle it is to get international solidarity to the cause that we all are in agreement with," Ros-Lehtinen said, "and that is the promotion of democracy, of freedom, of human rights, multi-party elections, freedom to express one's ideas, and freedom to pray to a God of our choosing." All three were arrested by Cuban authorities as part of Fidel Castro’s crackdown on dozens of dissidents and activists in what became known as the Black Spring of 2003. They were released under an agreement negotiated by the Spanish government and Cuba’s highest-ranking Catholic, Cardinal Jaime Ortega. One of the former political prisoners, Iglesias, said he met Wednesday in Dallas with former U.S. President George W. Bush and the former president of Spain, Jose Maria Aznar. He said he aimed to bring forth the message of a "Free Cuba," and not just in the economic sense some Cubans have seen recently. "The fact is that more than the power to purchase cars or houses, Cubans need freedom, free elections, respect to individual freedoms," he said. Hernandez, who spent more than seven years in prison and now lives in Miami, said his aim was to "bring awareness about the experience we have lived through." He warned that economic freedom "does not bring freedom nor democracy to a people, and certainly not to a country under an iron tyranny for 52 years." Rep. Mario Diaz-Balart, R-Miami, called it a "huge privilege" to spend time with with the three. They represent the best of what is in Cuba, said Rep. David Rivera, R-Miami. "People who are willing to risk their lives, their liberties, sacrifice friends and relationships on the island," Rivera said, including leaving everything "for the cause of a free and democratic Cuba. They demonstrate to the world of what is going on on the island." Isabel Morales, a special correspondent for El Neuvo Herald, contributed to this report. In the Eastern city of Guantanamo, the home of Niovis Rivera Guerra, (member of the Resistance and Democracy Movement), his wife, Yurilaidy Travieso and three young daughters, 13, 9 and 3 years old, was surrounded by patrol cars, military vehicles, and subjected to, at least, two days of brutal mob attacks (October 25-26, 2011) of around 400 people. Asphalt was thrown against the house, all the windows, as well as the door, were stoned and broken, the family received death threats, and Rivera Guerra was beaten and tear gased. All this brutal violence was because the family displayed pro democracy and human rights posters in the front of their home. This is the fifth time in 2011, that the home of this activist is attacked. Several members of the Resistance and Democracy Movement were beaten and arrested when they tried to come to the aid of Niovis Rivera Guerra and his family: Hermis Figueras Ros, Francisco Osoria Claro, and the Adventist Pastor Raul Martinez Caraballo. Also in Eastern Cuba, on October 26, 2011, several cities suffered government repression, In Contramaestre, any activist or citizen who visits the home of human rights defender, Jorge Cervantes is under scrutiny by the political police. In Moa, Rapid Response Brigades threw eggs against the home of the coordinator of the UMPACU, Juan Carlos Vazquez Osoria and the Lady in White, Annis Sarrion Romero. Two human rights defenders in Santa Clara (Central Cuba) who were on a hunger strike since September 28, 2011, demanding that the Cuban government put a stop to the violence against peaceful activists, were taken in critical state to the Provincial Hospital Arnaldo Milian Castro. Alcides Rivera Rodriguez was admitted to the hospital on Thursday, October 27, 2011, and diagnosed with bronchopneumonia. Rolando Ferrer Espinosa was admitted on the following day. Alcides has lost almost 60 lbs. while Ferrer Espinosa who is suffering a severe abdominal pain has lost over 30 lbs.of his body weight. Both continue in critical condition. On October 24, 2011 several human rights activists were arrested in Havana when peaceful organizations such as the National Front of Civil Resistance and Desobedience and the Human Rights Party called on activists to gather at the Martin Luther King Park. Adjacent streets to this park were all surrounded by State Security agents. Among several activists arbitrarily detained and released were Sara Marta Fonseca and Rodolfo Ramirez Cardoso. On Sunday, October 30, 2011, ten Ladies in White, in Eastern Cuba, were beaten and arbitrarily detained as they tried to attend mass in the Cathedral of Santiago de Cuba. The following women were mistreated and suffered short term detention: Aymeé Garcés ( as well as her husband Julio Valcarcel) Leyva, Belkis Cantillo Ramírez, Vivian Peña Hernández, Liudmila Rodríguez Palomo, Adriana Núñez Pascual, María Elena Matos, Oria Casanova Moreno, Yuremi González Pavót, Tania Bandera González, Ana Celia Rodríguez Torres and a minor 14 years old, Marta Beatriz Ferrer Cantillo the daughter of Lady in White, Belkis Cantillo and the expolitical prisoner of conscience, Jose Daniel Ferrer. At least three homes of activists who had gathered in the Eastern cities of Palma Soriano and Palmarito de Cauto to protest the violence against the Ladies in White on October 30 were surrounded by repressive forces. Under siege were the following human rights defenders of the National Front Orlando Zapata as well as members of the UMPACU ( Patriotic Union of Cuba): Prudencio Villalon, Roberto Quiñones, Pedro Manuel Guerrero, Julio Cesar Salazar, Ruben Torres, Dany Lopez, Rudy San Ramirez, Rolando Humberto Gonzalez, Maximiliano Sanchez, Abraham Cabrera, Amauri Abelenda and Manuel Martinez.